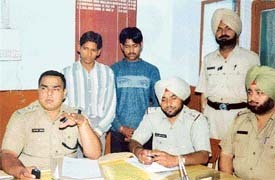 The Ludhiana Vigilance Bureau today received a shot in the arm when a city court dismissed the anticipatory bail applications filed by accused in the multicrore Municipal Corporation fuel scam. The anti-encroachment drive launched by the local municipal corporation in the wake of High Court orders to remove all permanent encroachments on public land seems to have fizzled out. The district police today claimed to have solved the case of murder of a youth, Vicky Sharma, whose body was found behind a factory in Salem Tabri about six months ago, with the arrest of two of his friends. 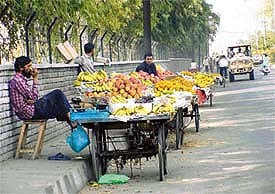 The directions of the Punjab and Haryana High Court for removal of encroachments on government land in the city notwithstanding, unauthorised settlements on green belts and other vacant sites in E-Block of Shaheed Bhagat Singh Nagar Colony in Pakhowal here are on the rise. Navneet Kaur, a student of the College of Agriculture, Punjab Agriculture University, has been selected in the Short Service Commission Examination, 2004. This was stated by Dr M. S. Tiwana, Dean, College of Agriculture. Singer Shaan enthralled the audience at the “Shaan Aksar Tour” concert, which was organised at South City here last evening under the aegis of Royal Stag Mega Music. Complimenting the Ludhianvis for their zest for life and passion for dancing, Shaan made the people dance to his tunes. Shaan started the musical evening by singing “Aksar kyon ye lage ki tum koi aur ho” from his new album, “Aksar”. 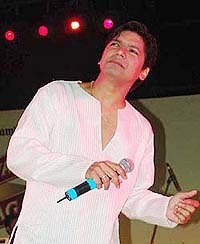 He sang popular numbers like “Ankhon se kajal ki terhan, phoolon se khushbo ki terhan” and “Kuch to hua hai, kuch ho gaya hai” from “Kal Ho Na Ho”. Mystery shrouds a robbery reported at Nagesh Factory in Salem Tabri late last night with the police, factory employees and the factory owner making different claims about it. Mr Shamsher Singh Dullo, Congress nominee from the Ropar (reserved) constituency, kicked off his election campaign from Amloh today. Mr Dullo has been allotted Congress ticket for the second time from this constituency. He had defeated the SAD candidate in 1999. The SAD-BJP candidate, Mr Sharanjit Singh Dhillon, was accorded a warm welcome on his visit to several villages in Machhiwara Block today. He was weighed against coins at eight villages. 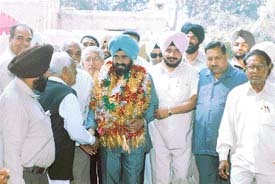 Mr Balwant Singh Ramoowalia, President of the Lok Bhalai Party (LBP) and candidate for the Lok Sabha parliamentary constituency from Ludhiana, while opening his election campaign in the old grain market Jagraon, said his party was fighting election on a definite agenda, whereas the SAD, Congress and the BJP lacked it. These parties had started to get the services of film stars and actresses to draw crowds and attract voters, he added. Ex-servicemen of Ludhiana district held a dharna peacefully in front of the SDM’s office in Jagraon on Tuesday in protest against the non-release of priority connections. The Shimla Puri police has arrested Davinder Kumar, a resident of Suraj Nagar at Chimney Road, and recovered two quintals of poppy husk from his possession. He was booked under Sections 15, 61 and 85 of the NDPS Act. After waiving installation charges till March 31, 2004, the BSNL has announced an alternative tariff option for WLL (M) on a par with basic services tariff applicable to urban subscribers. Other terms and conditions applicable to the handset availability option remains the same, says Mr G.S. Julka, General Manager, Telecom. WLL mobile (Tarang) service was launched by the Chief General Manager of the BSNL, Mr G.S. Bhatia, at Khanna on Wednesday. 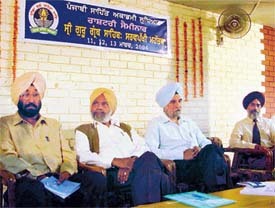 Khanna has become the fourth city in Punjab where this facility has been started. Hundreds of students received awards at an annual prize distribution function organised at Shanti Tara College, Ahmedgarh, here yesterday. These students have won first three prizes in the house examinations. Dr G. L. Goel, Director, Health and Family Welfare, held a meeting with Civil Surgeons and District Immunisation Officers (DIOs) of Malwa region to review the Pulse Polio campaign. He asked the officials to involve NGOs, social organisations and volunteers to make the next round of polio immunisation, scheduled for April 4, a success. On the penultimate day of the eighth All India Mohinder Partap Singh Grewal Memorial Women’s Hockey Tournament being played here at Deso Turf ground of Punjab Agricultural University, Central Railway, Mumbai, defeated the defending champions, Northern Railway by 2-0.